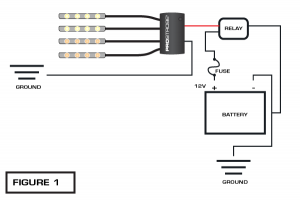 How do I re-synchronize my EZ-LEDController? How do I reset my EZ-Wireless Command? To reset the wireless controller press and hold the Dimmer button for 5 seconds. This will reset the wireless controller to Factory Default. TIP: Factory Default settings – Channel 1-4 is set to Pattern 2, Channel 5 is set to Pattern 12. 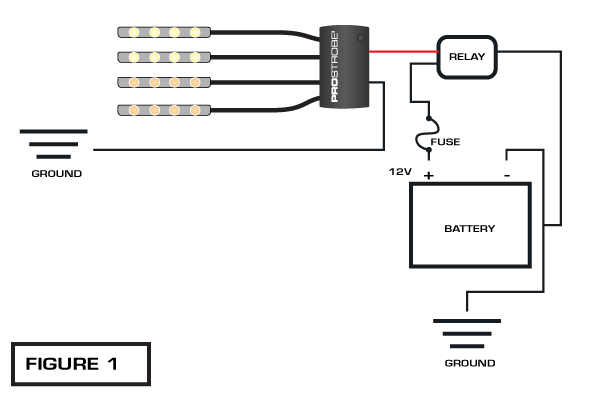 Can I run more than one Prostrobe product off of the EZ-LEDController? The answer to this one is no. Each controller syncs separately to the controller included with your product. However, if you are looking to run more than one product off of a single controller, you should try our EZ-Wireless Command. This controller allows you to control up to 5 Prostrobe, Alpena, or WhiteLight products from one convenient controller. Is my ProStrobe product completely waterproof? Aside from our wireless controllers, most of our products are waterproof to some degree. You can tell just how waterproof the product is by its IP rating. Our product’s IP rating should be listed in the product details. In general, here is what you need to know about IP ratings in regards to our products. The higher the number, the more it protects. What is the warranty/life expectancy on my ProStrobe product? We provide a 50,000hr or 3 year LED warranty on all of our ProStrobe products. If your product is broken or defective, give us a call and you may be eligible for a replacement. If you are in need of any additional information, please feel free to contact our customer care line or sent us an email. We provide installation instructions in or on the packaging of all our products. 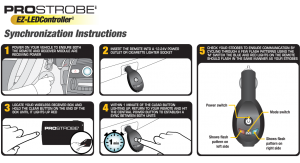 If you have lost yours, you can find them on our Installations Instructions Page. If you are in need of any additional instructions, please feel free to contact our customer care line or send us an email. Where do I connect the positive wire when installing my ProStrobe product? For more installation instructions you can try our Installations Page. If you are in need of any additional instructions, please feel free to contact our customer care line or sent us an email. Where should I install my product? For ideas on where you can mount our product, please go to our Community Page. 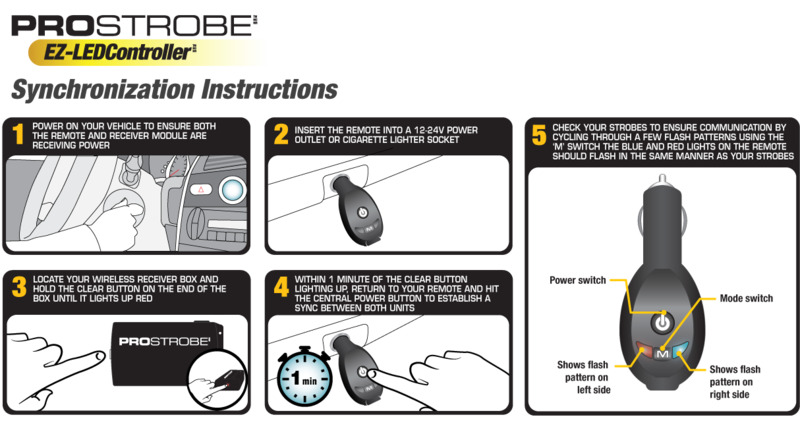 Here you can find pictures and videos of where others have mounted their strobes. When you are finished installing your product we would love to see it! Please send us your pictures and we will add you to our Community Gallery. You can also tag #ProStrobe on social media. Where should I mount the receiver box? 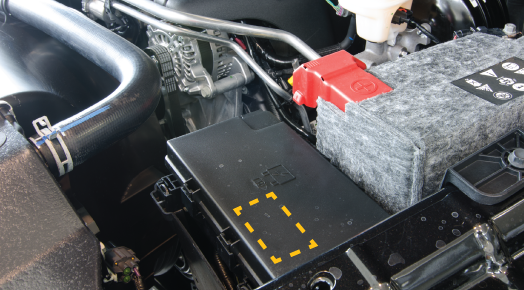 We recommend that you mount the receiver box near the battery, under the hood, safer from moisture and road debris. Do not mount close to excessive heat sources such as exhaust components or a radiator. Ensure any planned wiring routes do not interfere with the operation of any under-hood components and moving engine parts. For complete installation instructions please see our Installations Instructions Page. On our site you may choose to pay by Visa, MarsterCard, or American Express. We accept any credit card usable through PayPal. Why should I create a personal shopping account? Never have to re-type your billing and shipping information over the Internet again for future purchases. You have the ability to set a different billing address from your shipping address in different countries, hence your shipping will automatically calculate from your shipping address. I cannot complete my order because it says "No shipping methods available". What do I do? If the text in our shipping methods box shows up as a light grey, all you need to do is wait a few moments while we get shipping prices from our various carriers. Then you should be able to select a shipping option and be on your way. PLEASE NOTE: Shipping prices will only be calculated once an address has been entered. If the message “No shipping methods available” shows up in black, please contact our customer care line. Keep in mind, we will only ship to locations in Canada and the USA. PayPal will not let me submit my payment information. What should I do? Please double check that you are using one of the accepted credit cards and that it is not expired. If you are trying to pay by credit card without logging into a PayPal account, please ensure that the email address and card you are using is not already connected to a PayPal account. If this is the case, a yellow message box will appear at the top of your screen notifying you of the problem. Please log in to PayPal if you wish to use that card. If you are still having problems, please contact our customer care line and we can take your order via credit card over the phone.